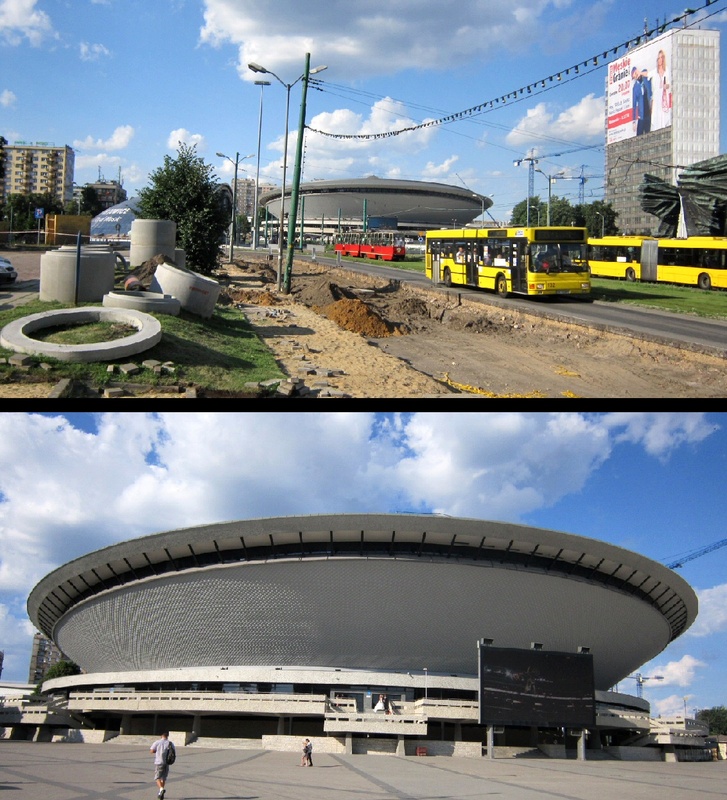 I thought I’d used up all the blogworthy photos from my recent trip to Poland, and then I remembered these pictures of the Spodek arena in Katowice. Unlike the Wieliczka salt mine (More Underground Art) and Wawel Castle (From Dragon bones to Chakra stones), Katowice is well off the normal tourist trail... so not that many people from outside the area will be aware of Spodek. 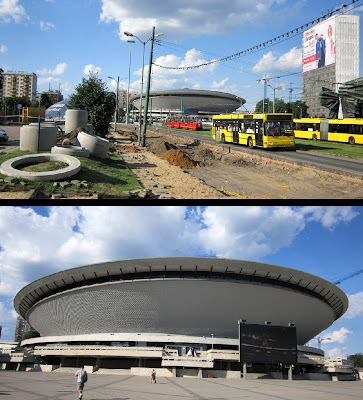 It was opened in 1971 as a sports, entertainment and conference venue, and the name Spodek is simply the Polish word for “saucer”. It’s tempting to say the Spodek building “looks like a UFO”, and few people would disagree with the statement. But the term UFO, when used by official organizations like the US Air Force and the UK Ministry of Defence, simply means “unidentified flying object” – with no reference to its shape or appearance. And hardened UFO enthusiasts frequently talk about craft that are spheroidal, cigar-shaped, triangular or V-shaped. But to the public at large, “UFO” means just one thing – a flying saucer. In this popular-culture sense of the term, Spodek is the first UFO-shaped building I’ve ever seen. The closest thing I’d come across previously was Paul Jackson’s photo of the “Big Blue” sculpture in Canada Square, as mentioned in my blog post Crashed UFO in London (see also Paul’s own post Canada Square UFO). However, a Google search quickly turned up a list of ufo-shaped-buildings and another one of 8-unique-ufo-shaped-buildings... and then buildings-that-look-like-UFOs-in-pics and 8-far-out-buildings-that-look-like-spaceships, not to mention Starship-Buildings-on-Earth-Mothership-UFOs-Across-the-Planet-Pics. Some of the buildings featured in these lists are simply eccentric private homes, or futuristic designs with only a passing resemblance to a flying saucer. But even after filtering these out, there are a surprising number of large public buildings that, like Spodek, appear to have been directly inspired by the popular image of a UFO. The montage below shows four examples that are important enough to have their own Wikipedia entries. 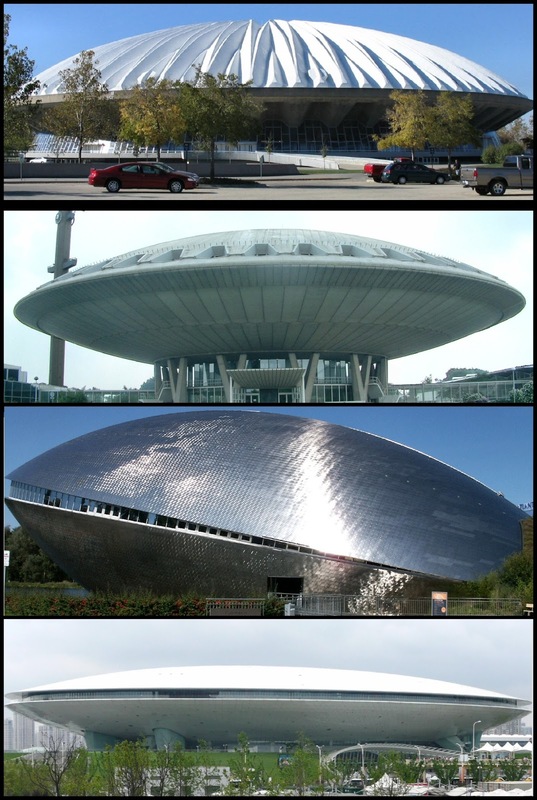 From top to bottom, these are: the University of Illinois State Farm Center (1963); the Evoluon conference centre in Eindhoven (1966), the Universum Science Centre in Bremen (2000) and the Mercedes-Benz Arena in Shanghai (2010). We took the kids to the Universum Science Centre when we were in Bremen - it was absolutely superb and wonderfully hands-on! Nothing to compare with it here in the UK! Thanks Kate - I guess that's one of the perks of working for a company with a head office in that part of the world! I also heard from Theo Paijmans via Twitter that he used to live just a street away from the Evoluon. 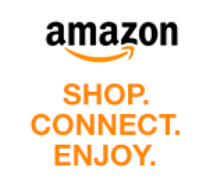 Excellent - thanks very much!